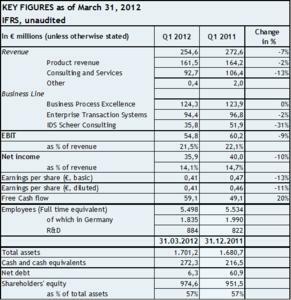 Software AG (Frankfurt TecDAX: SOW) reported record first quarter Business Process Excellence (BPE) revenue of €124.3 million (€123.9 million in 2011). This growth was primarily driven by very strong performances in Europe and the introduction of new products. Enterprise Transaction Systems (ETS), performed better than expected, with total revenue of €94.4 million. The company's software product business (license and maintenance) reported total revenue of €161.5 million close to the outstanding performance of Q1, 2011. Total maintenance revenue reached an all time high for a quarter of €96.3 million. Despite higher spending on R&D, Sales and Marketing, the EBIT margin reached 21.5% and free cash flow was increased by 20%. The company confirmed its guidance for the full year 2012, published in January of this year. "The sustained success of the Business Process Excellence division in Europe once again demonstrates the strength of both our product portfolio and our new go-to-market strategy, a strategy that we are now rolling-out globally", said Software AG CEO, Karl-Heinz Streibich. The Business Process Excellence division showed the same development as in the second half of 2011 with strong growth in DACH and EMEA. It is expected that this positive development will also be seen in the USA in the second half of the year. The first quarter 2012 showed a 1.5 percent increase in BPE product revenue to €80.6 million exceeding the extraordinary first quarter of 2011 by €1.2 million. Total business division revenue of €124.3 million is a record high for a first quarter. During the quarter under review, the Enterprise Transaction Systems performed better than anticipated. Product revenue of €76.3 million, services of €17.8 million and total revenue of €94.4 million have laid the basis for a full-year performance within the guided corridor. The IDS Scheer Consulting division reported sales of €35.8 million. The withdrawal from unprofitable markets such as China and Russia and the general focus on profitable projects resulted in a reduction of revenue. As previously announced, Software AG has conducted a review of strategic options for the further development of the global IDS Scheer Consulting business. The company has decided to develop the IDS Scheer Consulting business as an independent operating company with an innovative partner management structure. Software AG is therefore focusing on continuity and the stability of customer relationships to generate growth. Software AG significantly increased BPE business line investment (+€7 million) in R&D, Marketing and Sales in the first quarter of 2012 laying the basis for accelerated global growth with new products. The company also further optimized administrative costs and therefore achieved an EBIT margin of 21.5 percent and an EBIT of €54.8 million (€60.2 in Q1, 2011). Net income in the quarter under review was €35.9 million (2011: 40.0 million) and earnings per share €0.41 (2011: €0.47). Free cash flow increased by 20 percent to €59.1 million and net debt was significantly reduced by over €100 million over the past twelve months to almost zero. "We have invested substantially in R&D, Sales and Marketing laying the basis for accelerated growth of our BPE business in the second half of this year; but we have also maintained a high EBIT margin and increased the free cash flow significantly", said Software AG CFO, Arnd Zinnhardt. A total dividend payout of €39.9 million or €0.46 per share (2011: €0.43) for fiscal year 2011 will be proposed by Software AG's Executive and Supervisory Boards at the shareholders' meeting on May 4, 2011. The financial results of Q1, 2012 have laid the basis for the successful development of the core business and for achieving the full year targets for fiscal 2012. Therefore the company affirms the forecast for the full year 2012, published in January, with growth of 5 to 15 percent in the BPE division and corresponding group revenue in the range of +/- 3 percent, both in comparison to 2011 (at constant currency). Software AG expects an EBIT margin of 23.0 to 24.5 percent for the current fiscal year.